Two stories in the news yesterday showcase the perils in which small businesses often find themselves when they get crosswise with big companies with powerful trademark portfolios. The first story (link here) is about Ken Litvack, the founder of NavQuest – a website that helps boat owners create their own ocean navigational charts. AOL LLC (“AOL”), the owner of the popular directions and road map website MapQuest, filed a trademark infringement lawsuit against Litvack to stop him from operating his website on the grounds that his the name NAVQUEST is confusingly similar to portfolio of MAPQUEST marks See AOL LLC v. Kenneth E. Litvack and NavQuest, Inc., Case No. 08-cv-00153 (E.D. Va. February 21, 2008). A copy of the complaint can be downloaded here. This is not Litvack’s first trademark run-in with AOL. In 2003, he filed an intent-to-use application to register the mark CHART QUEST (for cartography and mapping), but the PTO rejected the application on the grounds of likelihood of confusion over AOL’s MAPQUEST and MAPQUEST.COM marks. That application went abandoned in 2004, but on August 18, 2006, Litvack filed another application (a use-in-commerce application this time) to register the mark NAVQUEST (for cartography and mapping services). While the PTO allowed this mark to be published for opposition, AOL filed a notice of opposition on August 30, 2007. See AOL LLC v. Ken Litvack, Opposition No. 91179250 (TTAB Aug. 30, 2007). The opposition has been suspended pending the outcome of the lawsuit. Vegas™Esq Comment: Because MapQuest is a strong mark, the similarity of the marks and the relatedness of the goods do not need to be as strong. The marks are very similar in appearance, sound, and meaning and the goods are similar (online mapping function). There is a good chance that the public is likely be confused as to source and origin. Personally, I think AOL should just buy the website from Litvack – it complements AOL’s MapQuest business model quite nicely (which further shows why Litvack may have an uphill battle). On March 17, Langley received a cease and desist letter from a lawyer representing IHOP demanding that Langley stop using the “It’s Hop’n” name and change the color of the “identifiable blue roof” by March 27th. Langley did not take the C&D letter seriously; however, with the filing of its lawsuit, Langley soon discovered that IHOP was very serious about its demands. 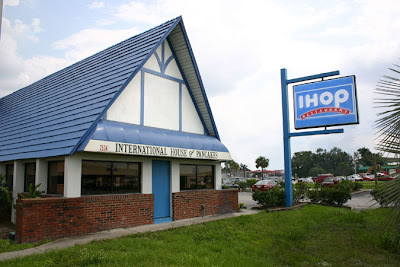 The lawsuit filed by IHOP against Langley not only claims infringement of IHOP’s trademarks, including a pending intent-to-use application for IHOP’N Go, but also for IHOP’s distinctive trade dress, specifically, the blue roof of the restaurant. See IHOP Corp. et al. v. John Langley, Case No. 08-cv-00168 (E.D. N.C. April 3, 2008). Interestingly, IHOP tried to get a registration for its blue roof trade dress, but does not appear to have been successful. IHOP had a registration for a roof design mark that was the color blue, but that registration was subsequently cancelled. IHOP is also an illustration of how big companies, while often aggressive in enforcing their marks, can also overlook simple maintenance details. On February 9, 2007, IHOP disclosed in a press release that it had allowed some trademark registrations to lapse, thus forcing IHOP to have to revise its Uniform Franchise Offering Circular. This apparently led to IHOP voluntarily surrendering many of its marks in early 2007 (see, e.g., IHOP and IHOP stylized) and opting to start fresh with new registration applications for many of the same marks. In light of IHOP’s lawsuit, Langley says that he is planning on changing the name of his restaurant to Langley’s Pancake House. However, he seems unwilling to repaint the roof. Langley claims that he did not pick the color of the roof, but that it was already painted blue when he agreed to take over the site, which had been vacant since the IHOP closed until a restaurant and bakery called Shirley’s opened in March 2007. The roof was beige, until a painting company (coincidentally owned by Langley) painted the roof blue at the request of the proprietors of Shirley’s restaurant. Shirley’s closed by the end of 2007, and so Langley, with some coaxing from the site’s landlord, decided to rent the building and open his breakfast restaurant. Vegas™Esq Comment: Smart move by Langley changing the name. The name may be “cute” (Langley’s own words), but it’s not so great that Langley should put up a fight against a big company like IHOP. However, I doubt IHOP will stop its lawsuit until Langley has repainted the roof as well. While Langley maintains that other pancake houses have blue roofs, those other restaurant likely do not have the same overall look as this particular location, which just so happens to have been an IHOP restaurant for a very long time. Langley seems adamant that he does not want to change the color of the roof, but he should really ask himself if a blue roof is really that important to the ultimate success of his business. What can you get by having a blue roof that you will not be able to get with some other bold color – unless your intent is to exploit a little bit of the goodwill that IHOP has garnered in the public mind with respect to a pancake restaurant with a blue roof. Given that Langley already owns a painting company, I assure you that repainting the roof will be less costly than fighting this trademark battle against this big company. Final Lesson: Do not underestimate the importance of seeking the advice of a qualified trademark attorney during the startup phase of a new business. A trademark attorney can help advise you in how to create and protect a unique business identity, including trademarks, from the onset and how to avoid becoming the target of a trademark infringement lawsuit.